While in Orlando this week, I had the opportunity to check out The Rusty Spoon. The Rusty Spoon is located in Downtown Orlando in Church Street and is a Farm to Table restaurant that celebrates great food and pub atmosphere. 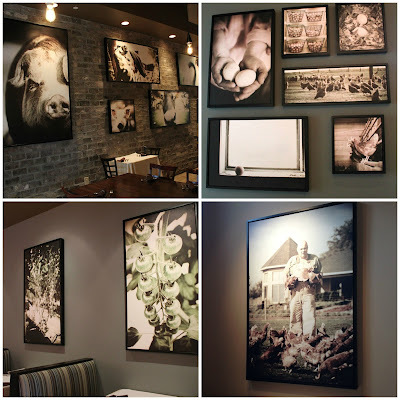 Behind the magic of this restaurant is the very talented Executive Chef and Owner, Kathleen Blake, 2013 James Beard Best Chef, South Semi-Finalist. 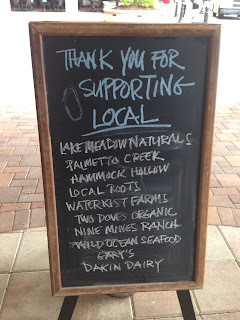 We were the first patrons of the day at Rusty Spoon, allowing us to go around and take plenty of photos of the restaurant who clearly celebrates the Farm to Table movement. We witnessed a few local farmers delivering produce for the weekend. Kathleen explained to us that deliveries happen throughout the day, 6 days a week and she also visits local farmers markets to ensure local fresh products. 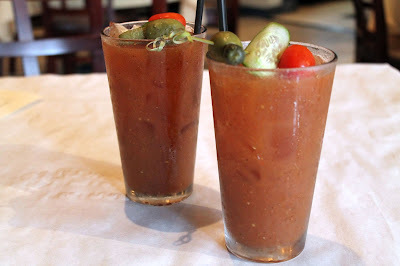 I dined with my friend Darlynn (thelittleblogdress.com) and we both started the day off with a handcrafted bloody mary. Upon one sip, we both freaked out as this was the best bloody mary one will ever consume. Darlynn set out on a mission to find out how this cocktail was made. Lucky for her, our server Brian happened to be the mixologist of The Rusty Spoon. Brian explained to us how he makes the bloody mary mix - charred tomatoes, charred jalapenos, charred celery, various spices and olive juice. There is no Mr. & Mrs. T's found in The Rusty Spoon. I never thought I would gush over the "freshness" of a bloody mary but that is what comes to mind....this was truly a fresh bloody mary! Darlynn and I split a few dishes, starting off with Lake Meadow Eggs - deviled eggs stuffed with loads of fresh herbs, house pickles & ovendried tomatoes. These eggs were perfect, delicious, and didn't last long in this world. 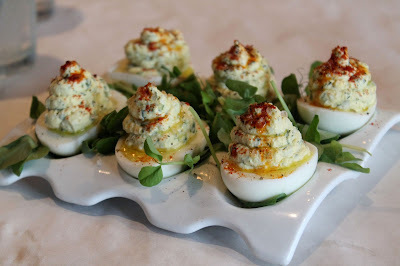 We devoured them and I will say they were the best deviled eggs I have ever had in my life. Up next was something that one would normally not split, but we had to order it due to the name. 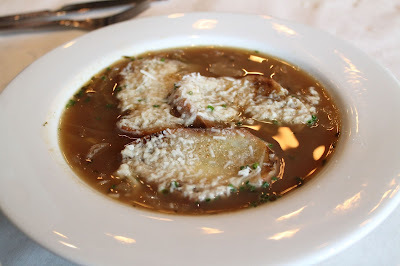 Shiittinonion Soup. I am still laughing over it today. 5 Onions, Roasted Double Chicken Stock, Topped with croutons & Melted Gruyere. I really enjoyed that this soup wasn't overly cheesy which allowed you to taste the onion. I would absolutely order this soup again. For our entree's, we started off with The "55" - 1/2 lb burger made with Grass-Fed Beef, Stuffed with Bacon & Gruyere, Smothered with Onions, Rusty Aioli & Housemade Pickles on a Soft Roll. We ordered this with the Haystack, Shoestring Potatoes with Three Sauces. The housemade ketchup was spectacular. The burger was HUGE. Even splitting it, we had a hard time finishing half of it. 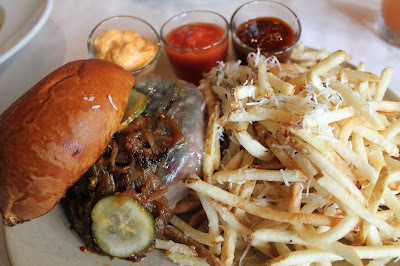 The housemade pickles had an awesome spice to them and the smothered onions were a perfect topping to this ginormous burger. 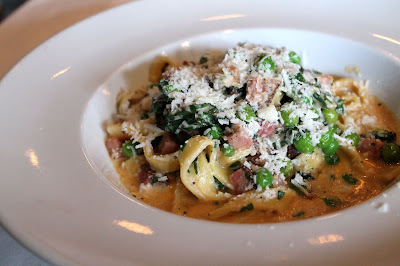 Darlynn and I instantly agreed on the Handcut Noodles - Southern Carbonara with smoked Tasso ham, peas, cracked black pepper, greens and pecorino. This was executed perfectly. We were both obsessing over the noodles. The flavor of the dish was insanely good. 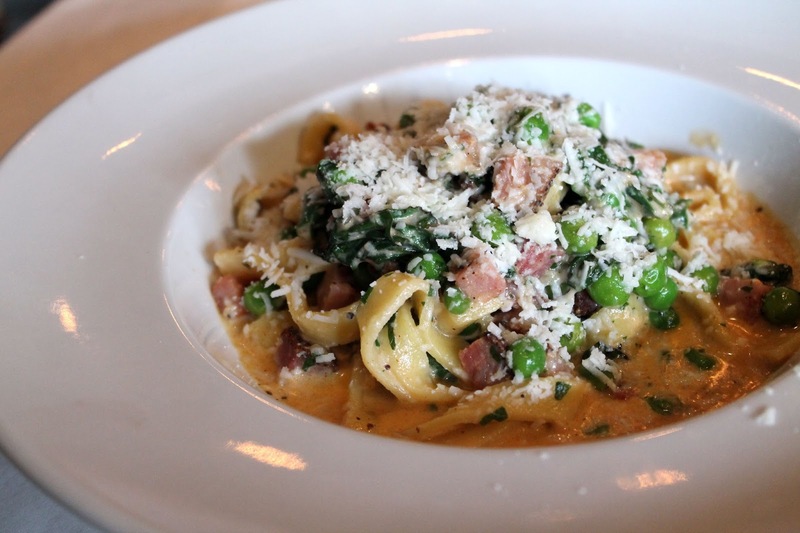 If you are a lover of fresh homemade pasta, you need to order this dish. At this point, we were beyond full. Yet Brian said the magic D word and we had to see the menu. 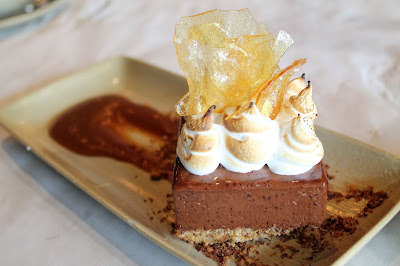 Upon looking at the Dessert menu, there was no going back as The Rusty Spoon had Grown-Up S'Mores - made with Brandy, Kahlua, Creme de Cocoa, a delicious salty Graham Cracker crust, a milk chocolate center, topped with homemade marshmallow fluff with Frangelico and candied salted caramel. BEYOND words. I ate two bites and it pained me to not finish this dish. I have passed The Rusty Spoon many times en route to a Magic game or other event at The Amway Center. After this delicious lunch, I am looking forward to go back and try their dinner ASAP. You can taste the freshness in every dish and it is no wonder that Chef Kathleen Blake was nominated for a James Beard award. Do yourself a favor and visit this restaurant while in Downtown Orlando. WOAH! This all looks so good. We are going here next time we are in Downtown! I think I would take a detour to find this restaurant for any one of the dishes you featured. They all look amazing!!! Oh!!! So good!!! I am gonna enjoy the leftover downtown Smores! YAY! Everything looks oh so delicious!!! The handcut noodles, oh my!!! I can't even keep up with you, my friend! So many great posts. I guess I'll start here and comment on up. Anyway, I viewed the deviled eggs and thought "Oh those sound great!" and then I got to the soup and I thought the same...and then the burger...and then the pasta. Seriously, I need to go and exactly replicate your experience, lol. Whoa. This place and Prato are on my Orlando "to-eat" list. Looks amazing!